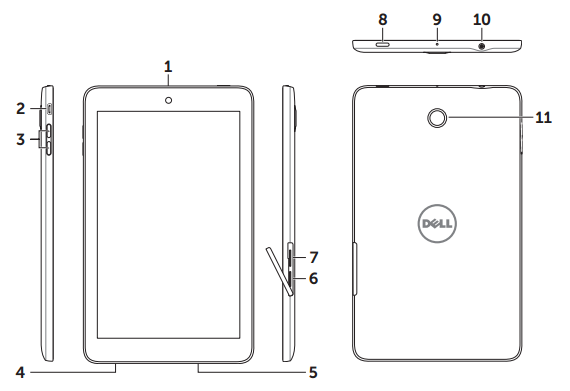 The Dell Venue 7 Manual is very important for owner of the tablet. The manual is available now and comes in pdf format. The Dell Venue 7 run on Android 4.2.2 Jelly Bean operating system. The tablet measuring 193 x 118 x 9.6 mm with weight are 8.25 oz. It has 7.0 inches IPS LCD capacitive touchscreen display with a resolution of 800 x 1280 pixels. This tablet equipped with 16 GB internal memory, 2 GB of RAM and support external memory up to 32 GB. For taking photo used 3.15 megapixel rear facing camera. The Dell Venue 7 is powered by 1.6 GHz dual core Atom Intel Z2560 processor and Li-Ion 4100 mAH battery capacity. Front camera Use to make video calls or to capture front photos and videos. Micro-USB port Connect the USB cable to charge your tablet or to connect to your computer. Volume button. Press to increase or decrease the volume by one level. Press and hold to continuously increase or decrease the volume. Service Tag label Provide the Service Tag when contacting Dell for support. MicroSD-card slot Insert a microSD card to expand the storage on your tablet. Micro-SIM card slot (HSPA+ models only). Insert a micro-SIM card to access mobile broadband. Power button. Press and hold to turn on your tablet. Press and release to lock or unlock the screen. In standby mode, press and hold to open the options menu. Microphone Use for recording sound or inputting voice in other voice-based apps. Headset connector Connect headphones or headset. Rear camera Capture pictures and videos. 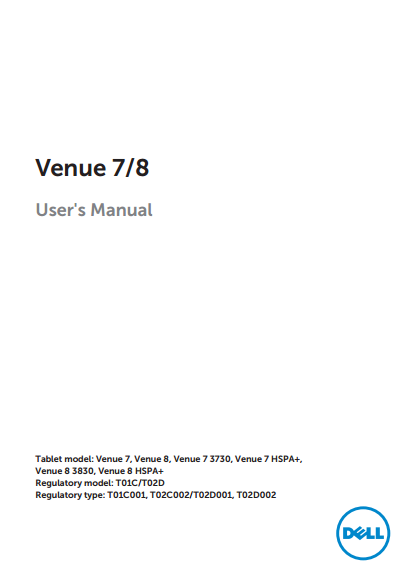 The Dell Venue 7 user manual is contains 28 pages with file sizwe of 1.16 MB. The manual also available in english language.It's provide detail reference information such as tutorial how to Turning on/off the tablet, Finishing Android setup, Customizing the screen, Locking and unlocking your tablet, Keys and functions, Apps and widgets. Then about using contacts, Connecting to the Internet using Wi-Fi, Connecting to the Internet using mobile broadband, Using the airplane mode, Browsing the Internet, Screen-unlock pattern, Face unlock, Protecting your SIM card with the SIM lock password (LTE/HSPA+ models only), using camera, using bluetooth, also Troubleshooting problem.